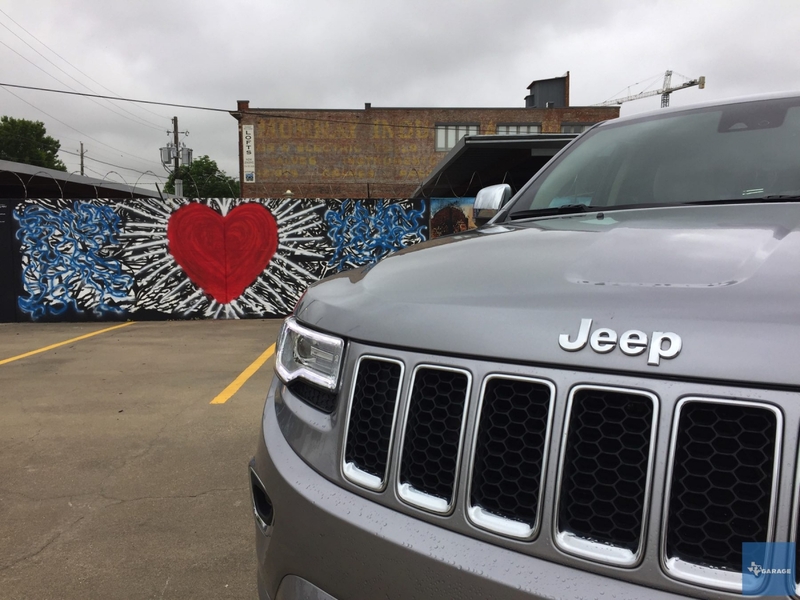 Since joining the Texas Automotive Writers Association and attending their annual Truck Rodeo I don’t recall a single year when Jeep’s Grand Cherokee didn’t take home a trophy. Every time I drive the Grand Cherokee, in any trim level, this SUV reminds me just how good it really is. I’ve spent quite a bit of time behind the wheel of the SRT powerhouse, I’ve driven both gas and diesel versions, and I’ve Grand Cherokee’d all over Texas on and off the road. This week I’m driving Jeep’s Overland trim Grand Cherokee, and I really like the combination of luxury, capability, and price. Let’s take a closer look and see what’s what. 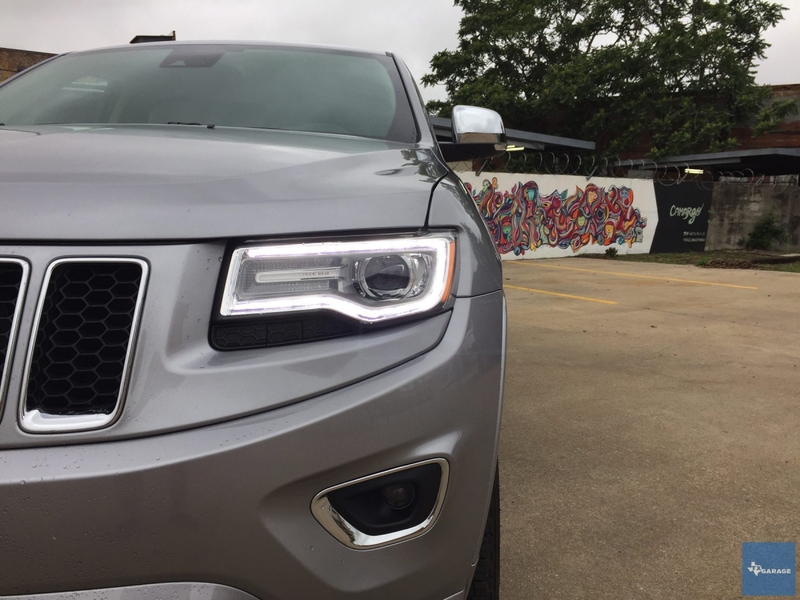 The Looks: In taking a look at the exterior design of the Grand Cherokee you’ll know it hasn’t changed much in the past five years. It’s a much less controversial design than that found wrapping the smaller Jeep Cherokee. The headlights have received a more modern and upscale look with a Chrysler 300-esque vibe. The profile is much boxier and bolder than most SUVs in its class and that helps convey its Jeepness. Even though it’s getting a little old I still really like and can appreciate the design. 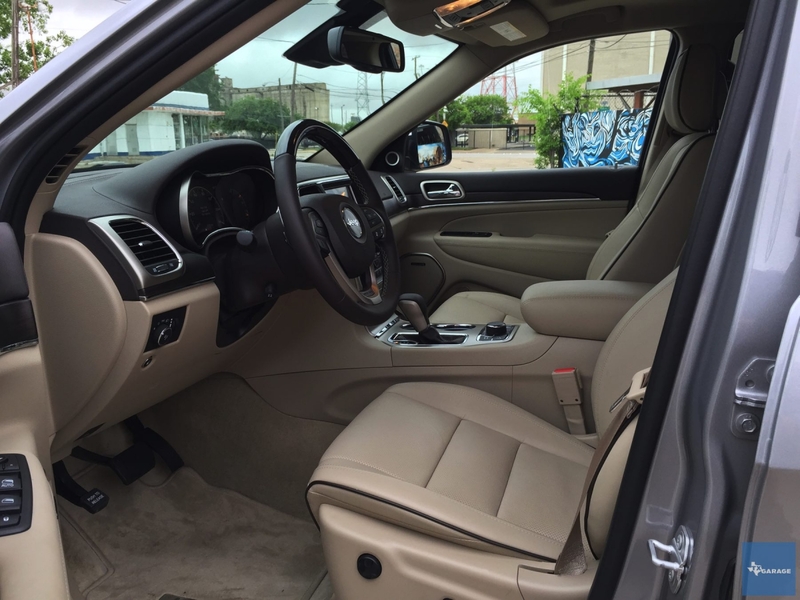 The Inside: Looking inside the Grand Cherokee you see one of the areas where this SUV really stands out from the crowd. 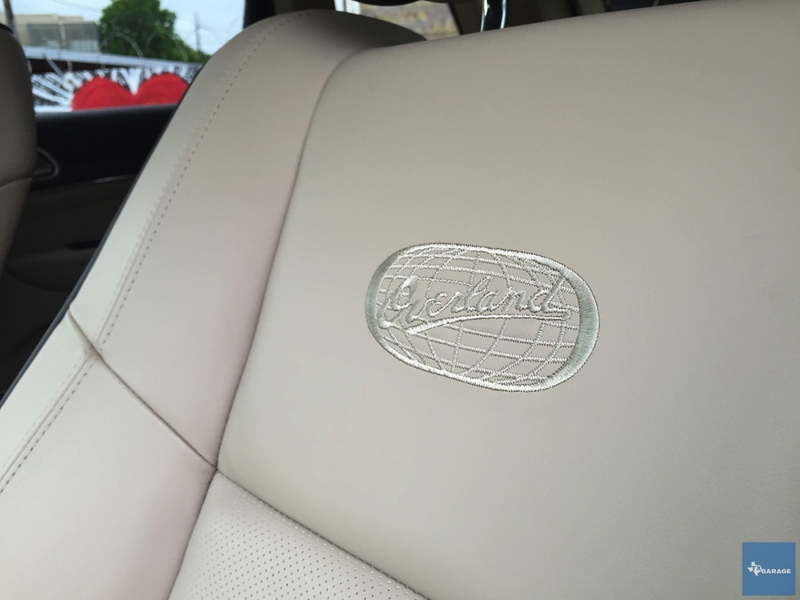 The interior quality is absolutely great, especially in the upper trims. 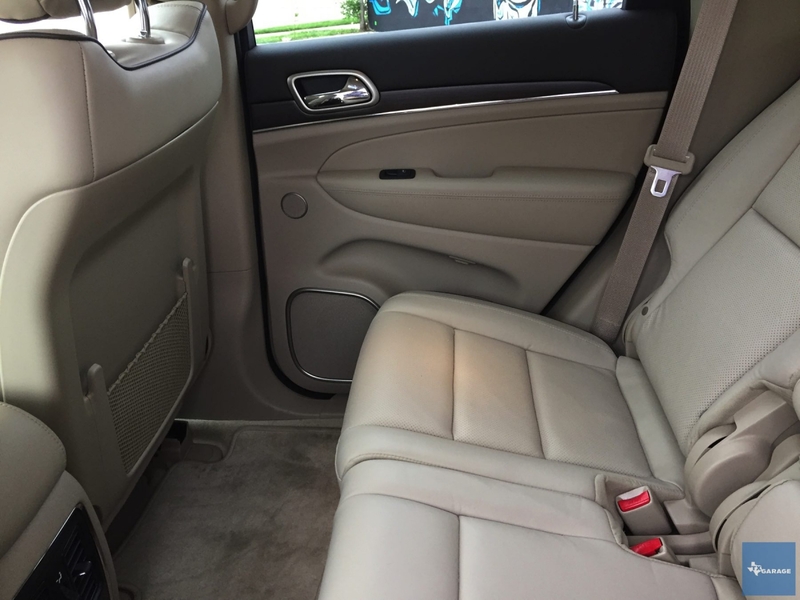 My review vehicle was equipped with the two-tone brown and light frost tan interior with wood and aluminum trim. I’m usually not a big fan of light interiors or wood but the materials Jeep chose for this vehicle just made it all work. It’s an extremely comfortable place to be and looks and feels very upscale. 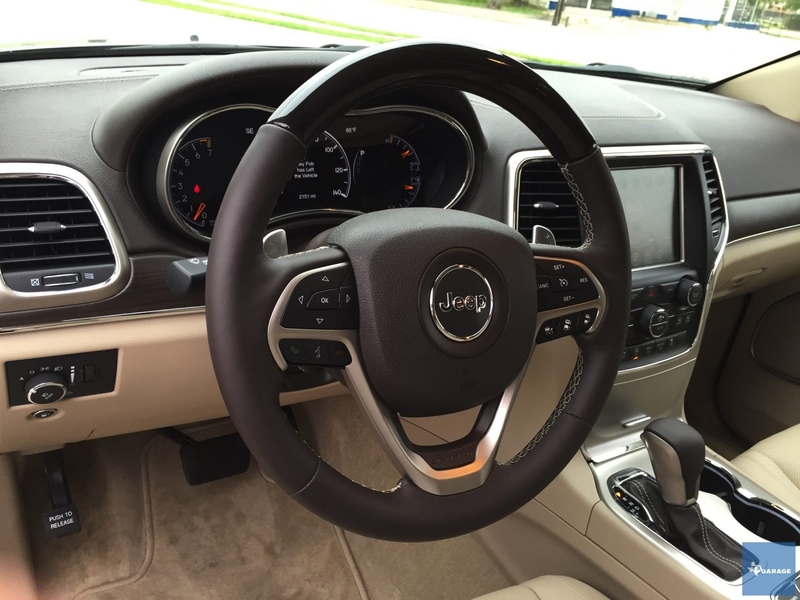 The steering wheel is beefy and fitted with an array of controls for navigating the driver’s info center, nestled in the middle of the speedometer, as well as buttons for cruise control and hands-free voice commands. Behind the wheel, comfortably in reach of your fingers, volume and radio controls make it easy to interface with your music. And if that wasn’t enough, you also get paddle shifters behind that. Moving along to the infotainment center, we had an 8.4-inch touchscreen display sporting Jeep’s Uconnect system. This is growing to be one of the better systems out there, with very clear and responsive controls. You also get access to apps such as a weather app that I took advantage of during my storm-filled week reviewing the Jeep. Although the Grand Cherokee isn’t offered with a 3rd row, the interior is very spacious and you have a lot of room in the rear for cargo. As long as you don’t need to carry more than 5-passengers, it will be just fine. My family is bigger (four kids) but we were still able to utilize the Jeep for a bunch of family errands carrying all but one kid. Under the Hood: The 3.6-liter V6 in our test Jeep gets up to 26-mpg highway mileage and offers up 295-horsepower, so it’s still pretty efficient for the size and has enough get-up-and-go for good highway maneuverability. This engine is matched up to an 8-speed automatic transmission, keeping the engine’s rpm low for optimal economy. The one gripe you usually hear with transmissions containing more than the normal 6-gears is that they tend to jump around, hunting for the perfect gear. The Grand Cherokee never seemed to suffer from this, as it was pretty much always smooth and responsive. 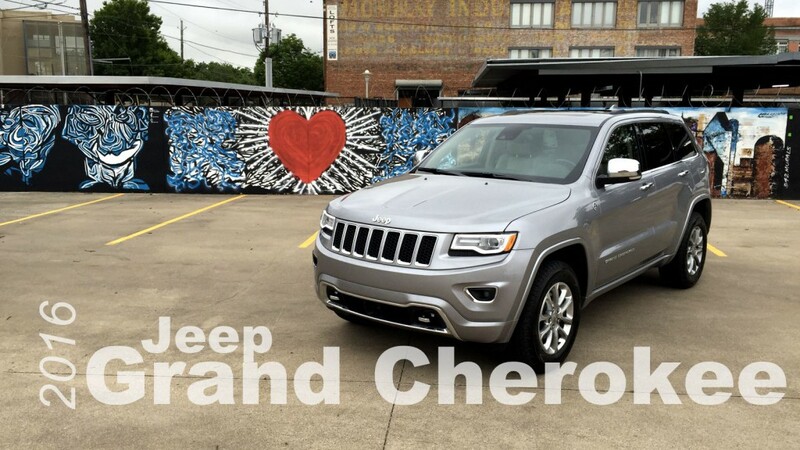 On Road: Using the Grand Cherokee as a daily driver means you’ll be cruising in smooth luxury. Connecting the wheels to the road is Jeep’s Quadra-Lift air suspension, supplying five height adjustments, and also gives you one of the smoothest rides out there. I really think that if you’re looking for a luxurious ride there’s not an option in this segment that competes with the Grand Cherokee. Off Road: One of the great aspects of our Truck Rodeo event is having the opportunity to really take these vehicles off the beaten path and see just how well (or not so well) they handle it. Throughout the years we’ve had some pretty difficult conditions at the Knibbe Ranch, but there’s never been a point at which I didn’t feel comfortable taking the Grand Cherokee – or any Jeep – along the gnarliest paths. During my week of testing this Overland the most off-roading this Jeep saw was parking in the field out at our local baseball complex. I drive out here every week taking my son to his games or practices, and with all the crazy weather we’ve been getting lately in Dallas the field is pretty beaten up. The week before driving the Grand Cherokee I was in the Colorado Diesel and before that we took our Grand Caravan out there. Both vehicles, while handling the conditions just fine, gave you a pretty rough ride in the rutted backroad. The Jeep, utilizing its air suspension, handled the road exceptionally well. It did so well I made an extra pass at higher speed; the Grand Cherokee was able to keep its composure the entire time. Wrapping up: I went into this review week already a big fan of this SUV, and for many good reasons. The biggest negative you can bring up regarding the Grand Cherokee is the ever-increasing price tag. Our Overland package occupies a good middle ground, coming in at just under $50K – but you can easily stretch that into nearly $60K, and swinging for an SRT can hit you for over $70K. When you think about it, this is the SUV that can deliver you everything from off-road capability to luxury on-road driving for one still-attainable price. In my book the Grand Cherokee remains an all-around win. Jeep Grand Cherokee – the most awarded SUV ever and the vehicle that has long defined what a premium SUV should be – gets even better for 2016. 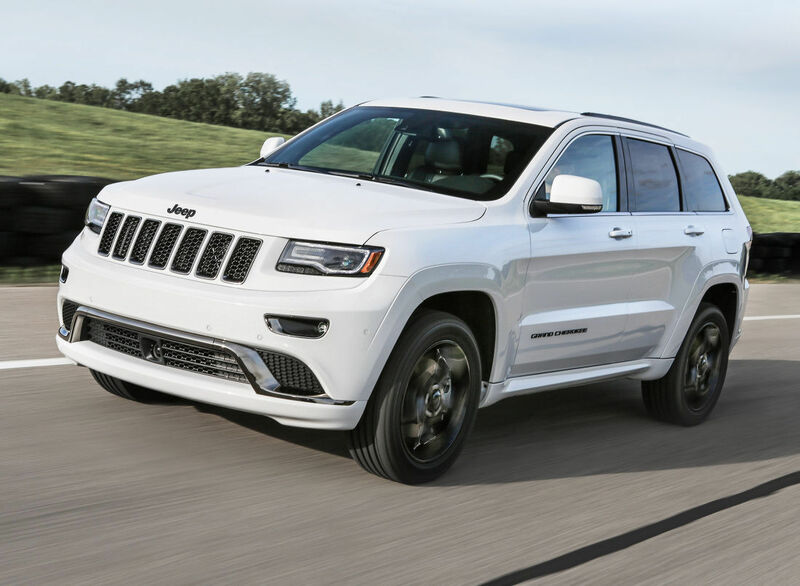 For 2016, all gas V-6 and 5.7-liter V-8 Grand Cherokee models will receive improved fuel efficiency due to electric power steering, decreased tire rolling resistance and weight reductions with aluminum suspension. Also new for 2016, the Pentastar 3.6-liter V-6 engine in the Grand Cherokee adds Engine Stop-Start (ESS) to improve fuel economy and efficiency. The 3.6-liter Pentastar V-6 engine in Jeep Grand Cherokee receives a bump in horsepower for 2016, increasing output to 295 horsepower. New Pentastar technology for 2016 also includes cooled Exhaust-Gas Recirculation (EGR), advanced two-step Variable Valve Lift (VVL) system and an upgraded variable-valve timing (VVT) system that reduces pumping losses and improves combustion. In addition, Grand Cherokee also features a new polystable shifter and Ivory Tri-coat exterior color for Overland, Summit and SRT models. The 2016 Jeep Grand Cherokee delivers consumers an unprecedented combination of best-in-class fuel economy and driving range, a choice of leading powertrain options, available clean-diesel technology, legendary benchmark capability, world-class craftsmanship, premium on-road driving dynamics, and a host of advanced user-friendly technology and safety features. Jeep Grand Cherokee delivers a best-in-class 30 miles per gallon (mpg) highway courtesy of an available 3.0-liter EcoDiesel V-6 engine and standard eight-speed transmission, and best-in-class towing of 7,400 pounds. 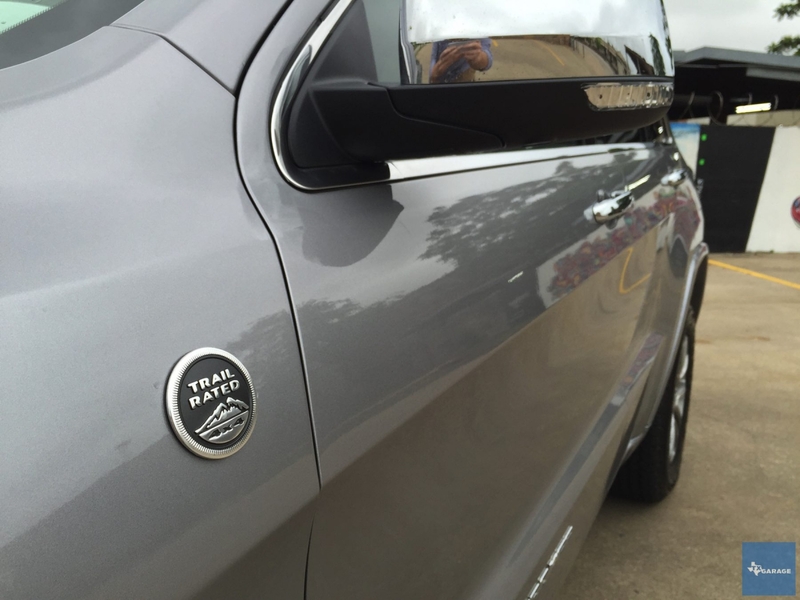 The 3.0-liter EcoDiesel V-6 boasts an unmatched driving range of more than 730 miles. Legendary Jeep capability comes courtesy of four available 4×4 systems, Jeep’s Quadra-Lift air suspension system and class-leading Selec-Terrain traction management system. 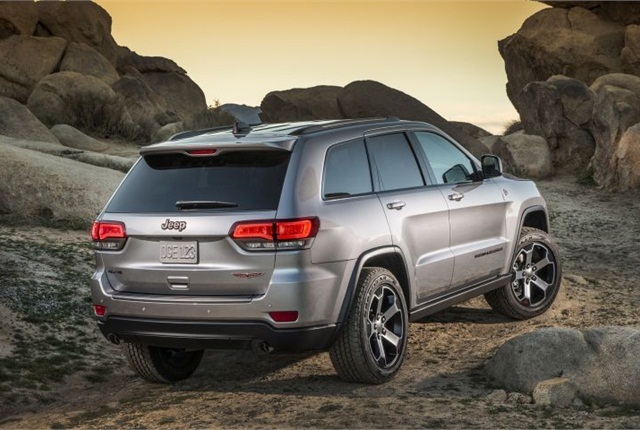 Grand Cherokee boasts best-in-class towing of 7,400 pounds, and a crawl ratio of 44.1:1. 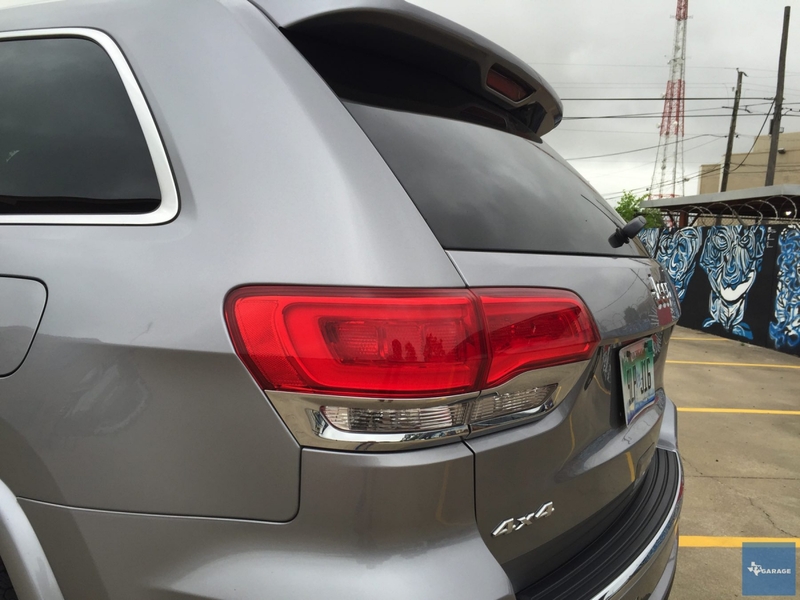 In addition, Grand Cherokee may also be flat-towed when equipped with Quadra-Trac II or Quadra-Drive II systems. 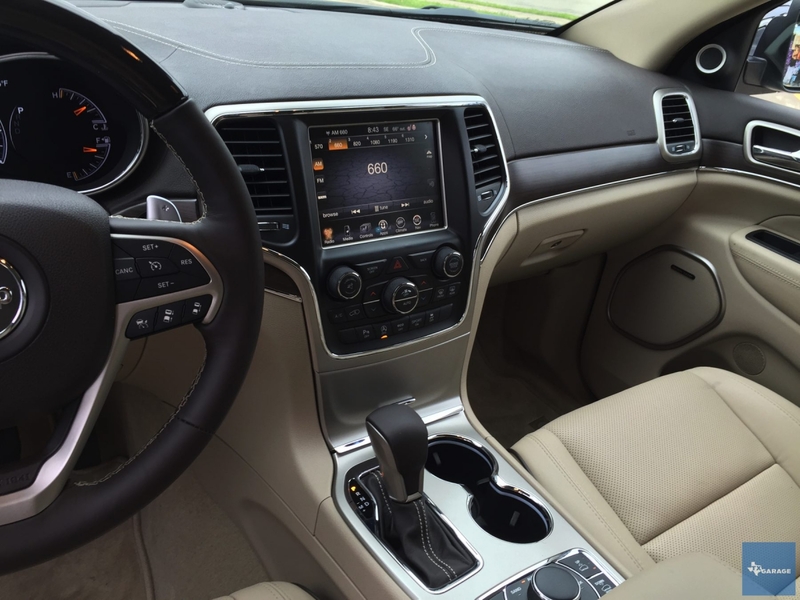 The 2016 Jeep Grand Cherokee includes more than 70 safety and security features as well as an array of advanced user-friendly technology features, such as the award-winning Uconnect 8.4-inch touchscreen radio with integrated climate and infotainment controls, a 7-inch customer configurable multiview display cluster, Uconnect Access Via Mobile, 3G Wi-Fi access and cloud-based voice texting. Originally introduced late in the 2015 model year, the Grand Cherokee lineup extends with the High Altitude special edition based on the Overland model. The 2016 Jeep Grand Cherokee High Altitude adds upscale dark chrome exterior features, along with premium content and more. Copyright © 2016 Automotive Fleet. All Rights Reserved. FCA’s Jeep unit will roll out two more Grand Cherokee models, including the Trailhawk and Summit, for 2017. The two models appeared at the New York International Auto Show, and will arrive at dealer lots in late summer. The 2017 Jeep Grand Cherokee Trailhawk adds off-road 4×4 capability features, including Jeep’s Quadra-Drive II 4×4 system with rear Electronic Limited Slip Differential (ELSD) for all powertrains, a unique version of Grand Cherokee’s Quadra-Lift air suspension developed for Trailhawk that offers improved articulation and total suspension travel, as well as Selec-Speed Control with Hill Ascent Control. Skid plates and a Trailhawk-specific anti-glare hood decal are also standard. The 2017 Jeep Grand Cherokee Summit arrives with an updated front fascia, grille and LED fog lamps, with new 20-inch polished aluminum wheels. 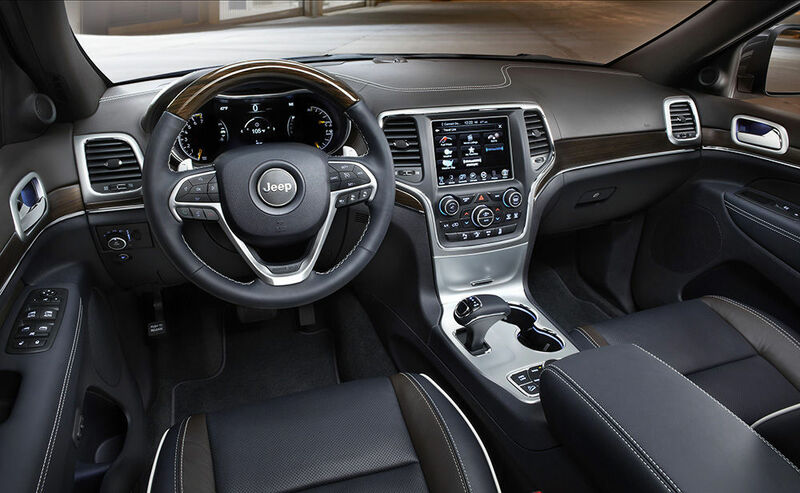 The full leather interior boasts a Nappa leather-wrapped dashboard, center console and door panels, and Laguna leather seats with edge welting. 2017 Grand Cherokee Summit adds more standard equipment such as auto-folding power mirrors, headlamp washers, blind spot detection, forward collision warning, adaptive cruise control and, for the first time, lane departure warning and parallel and perpendicular park assist.